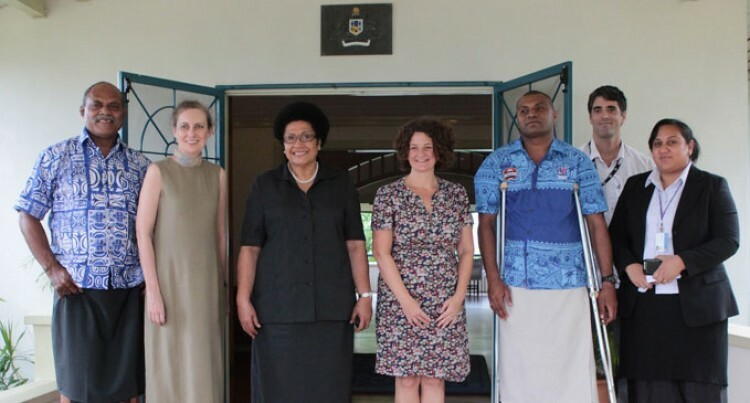 From left: FijiFirst MP Samuela Vunivalu, Australian High Commissioner Margaret Twomey, Speaker to Parliament Jiko Luveni, Deputy High Commissioner Karinda D’aloisio, Assistant Minister for Youth and Sports, Iliesa Delana, Deputy Secretary-General Jeanette Emberson and First Secretary, Governance Marcus Khan. Fijian Parliament Speaker Jiko Luveni yesterday thanked the Australian Government for the successful visit of the six-member parliamentary delegation to Australian parliaments early this month. While meeting Australian High Commissioner Margaret Twomey at the High Commission in Suva, Speaker Luveni, on behalf of the delegation, thanked her and her government for the opportunity to visit the Federal and Victorian parliaments. “We learned a lot in one week and I’m sure the Members of Parliament were grateful to be part of this visit,” Dr Luveni said. One portion of the programme highlighted was the launch of the #HeForShe campaign for International Women’s Day at the Federal Parliament. “This was an excellent programme where leaders came together to be part of this programme. The Fijian Parliament will try to put together similar programmes in future,” Speaker Luveni said. In Melbourne, she signed a historic Parliamentary Partnership Agreement with the Parliament of Victoria that will enable the two parliaments to exchange information, training activities and professional development of parliamentarians and parliamentary staff. Present at the High Commission yesterday were two members of the group that visited Australia – Assistant Minister for Youth and Sports Iliesa Delana and Government backbencher Samuela Vunivalu.